When a colleague shares content with you, using the Share button, it appears in your Shared with me container. The dashboard or report is only available from Shared with me and not available from Apps. Watch Amanda explain the Shared with me content list and demonstrate how to navigate and filter the list. Then follow the step-by-step instructions below the video to try it out yourself. 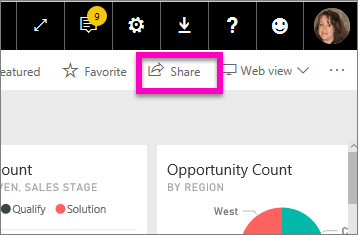 For you to view dashboards shared with you, you need to have a Power BI Pro license. Read What is Power BI Premium? for details. You'll have options for interacting with the dashboards and reports, depending on the permissions the designer gives you. These include being able to make copies of the dashboard, open the report in Reading view, and re-share with other colleagues. Select the star icon to Favorite a dashboard or report. Additionally, if your lists get long, use the search field and sorting to find what you need. For information about EGRC classifications, select the classification button or visit Dashboard data classification . Select the name of a dashboard to open it and explore. 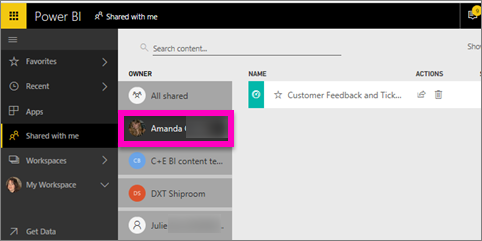 Once you've opened the shared dashboard you can use Q&A to ask questions about the underlying data or select a tile to open and interact with the report in Reading view. The content in the Shared with me screen can be further filtered by content owner. For example, if I select Amanda, I see only the dashboard that Amanda has shared with me.